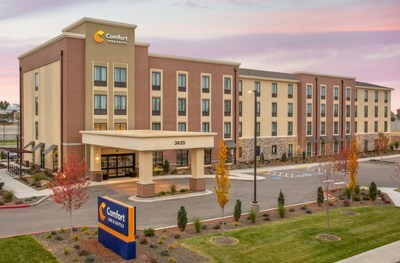 ROCKVILLE, Md., Jan. 28, 2019 /PRNewswire/ -- The Comfort brand, franchised by Choice Hotels International, Inc. (NYSE: CHH), continues to advance its transformation with over 700 properties certified Move to Modern, 450 hotels in the process of obtaining new signage, and more than 170 hotels having installed new signs. In addition, Choice awarded close to 120 Comfort brand franchise agreements in 2018 as it expands around the country. The new Comfort signage, which was unveiled in May 2018, can now be seen on hotels in top markets, such as Austin, Texas, Charlotte, N.C., Little Rock, Ark., and Seattle, signaling the brand's refreshed look and feel as guests check-in and experience the modern interior. "We have been working tirelessly to enhance the guest experience at all of our Comfort hotels, and the response from travelers and franchisees has been incredible," said Anne Smith, vice president, brand management, design and compliance, Choice Hotels. "Comfort hotels that have completed renovations are already outperforming the rest of the brand. We couldn't be more excited with the brand's transformation and the new logo, especially as the new signs start to appear at hotels across the country." The new signage is the final step in the Comfort brand's $2.5 billion long-term investment along with franchisees that includes refreshed lobbies, upgraded guest rooms, and 100-percent smoke-free hotels. "Comfort's new look and feel continues to attract developers who want a proven brand they know will be successful," said Brian Quinn, vice president, head of development, new construction brands, Choice Hotels. "The nearly 120 Comfort brand franchise agreements awarded last year illustrates its consistent strong demand and fuels future growth." For more information on Comfort Hotels development opportunities, visit choicehotelsdevelopment.com/comfort/.